“The ugly fact is books are made out of books,” Cormac McCarthy once said. “The novel depends for its life on the novels that have been written.” But as well as appending those remarks to a list of his literary influences, McCarthy named the writers whose work he most dislikes (Marcel Proust, Henry James) and suggested that his own books are made not only out of others but against them as well. According to this view of things, literature is a form of protest against a sense of absence in the world. Since readers hardly need new work that merely echoes work already in existence, there must be, among the forces that compel a person to sit down and write a book, some lingering dissatisfaction with the books already written and some notion of a sort of book that has not been written before. Those forces are certainly what compelled me to write my novel Blood and Bone, a novel that contains traces of the books instrumental to its creation and that also, in a way, endeavors to unwrite them. Thomas Keneally, David Malouf, Kate Grenville, Rohan Wilson, Geraldine Brooks, and Hannah Kent each score a mention for having influenced the writing of Blood and Bone in much the same way that Proust might have influenced Blood Meridian. The Sydney Morning Herald and The Age. 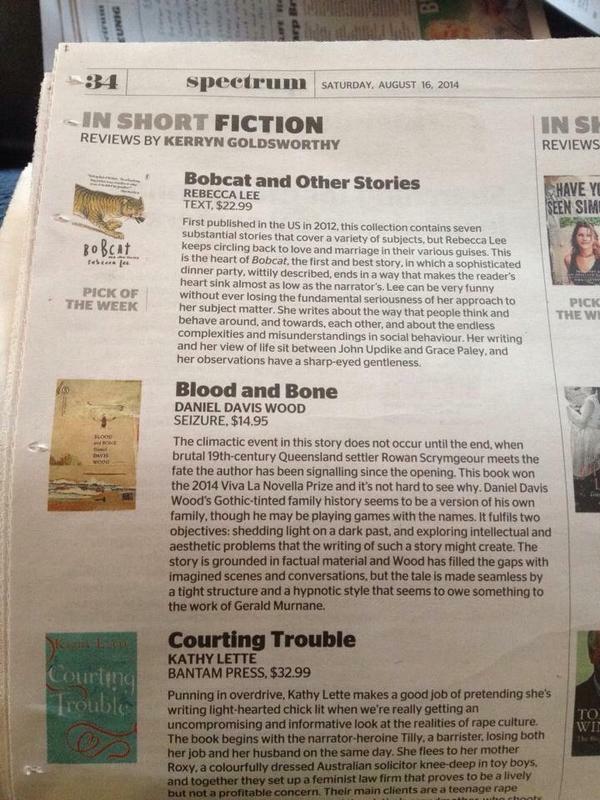 Today’s Sydney Morning Herald and The Age carry a short review of Blood and Bone. Kerryn Goldsworthy, one of Australia’s best critics and winner of last year’s Pascall Prize, says that it “fulfils two objectives: shedding light on a dark past, and exploring intellectual and aesthetic problems that the writing of such a story might create.” Click here to read the review online or click the picture to read it as it appears in print. on the recent releases shelf in Melbourne’s Paperback Bookstore. A well-known writer of fiction in this country, once, as part of a discussion about one of his books, which could fairly be called a work of historical fiction, said or, perhaps, wrote words to the effect that he insisted on his right to imagine the past. I have often wondered at his statement. If I assume that he was not making the preposterous claim that he was somehow better qualified than other living persons to suppose what one or another person thought or felt, say, a hundred years ago, then what was he claiming? Perhaps his emphasis was on the word imagining, as though he had other means at his disposal for discovering what this or that person felt a hundred years ago but chose to use his imagination. And yet, what other means could he or anyone possibly call on for such a task? Reader, we are all of us, whether writers or readers, surely obliged to imagine the past, although I, who dislike the word imagine, would prefer to use such an expression as speculate about. …what occurs between the two is a stunning powerplay that exposes the limits of the human imagination. Inhabiting the speculative peripheries of the historical record, Blood and Bone is an uncompromising exploration of Australia’s dark history and its legacy today. During the years it took Scrymgeour to assemble the Whangie, he found a place for his dependants in basic lodgings in Rockhampton. My understanding is that, in his absence, the woman spent the weeks leading up to their relocation in what was diplomatically described to me as a nervous state. I can only speculate on how her nervousness might have shown itself. I do know that she kept a robust library which she was largely forced to sell off in advance of leaving the coast for the Whangie. I imagine she confined herself to her bedroom, kept herself behind closed doors, and spent a large portion of each day immersed in her beloved words. How else to divert her thoughts from the torment of her life in this place and the dissolution of the family who might have at least made it bearable? On those rare occasions when she emerged, I imagine, she carried a book in her hand and sat in a chair by a window but soon forgot about reading as she daydreamed gazing over the lively city outside. Could her son have been walking those streets just then, trying to find his way back to her and back to the home she kept in good order in the hope of his return? She rarely spoke aloud, I imagine, and I’m sure that when she did, during her last days in the city, her words took the form of platitudes intended to bury her daughter’s anxieties under promises so idyllic that no one could possibly take them as truth. Father, mother, and daughter, she said, would all enjoy their new lives out west. They would wake each morning beside a river at the foot of a mighty mountain. The girl would be given her very own room in a house on a beautiful farm, and there they would all live simply and without worries in plenty of fresh air and sunshine. It must have taken them about ten days to reach the Auchtermuchty Bend, or perhaps a little longer with a few days’ rest in Emerald. Mother and daughter saddled together on a single mount. Scrymgeour scouted their route up ahead, a rider in the distance, all but dragging them through a land that grew more bleak, more austere, more forbidding with every lilt of the horse. I see the animals twitch their ears and swish their tails as the swarms of flies intensify, and I hear leather satchels full of water slapping hard against their sides. They loosen their hold on the bit as they plod further into the desert, and I notice the reins, once firm, now begin to slacken. I don’t think I’m able to comprehend the tedium of the westward journey. Uncountable hours of intolerable heat, the endless muttering of flies, and the warm breath of the inland wind. The groan of saddles, the clink of bridles, the monotonous thud of hooves newly shod. I can sketch the conditions of the ordeal but words alone are, I think, too weak to evoke the experience of it. To stop and dwell on its enormity, to attempt to internalise those conditions, is to reach out to grasp a horizon that recedes with every step towards it. And how to then convey the despair that surely descended upon mother and daughter when they reached their destination and for the first time saw the Whangie? Day after day through the desert only to arrive at that lopsided shack, a speck on the limitless landscape, shrunken beneath the Auchtermuchty Escarpment. No sense of grandeur or ceremony. No sense of comfort and no sense of relief. A couple of months, at most, before the Christmas of 1888, and this after owning the property for twenty years and postponing migration because the difficulty of raising their youngest child so far from the coastal cities would have made the woman’s life torture whenever her husband was droving stock. Not that she would bear it for long even when he stayed home with her. From the moment of their arrival, she had perhaps six weeks left to live. I can’t help but wonder if she felt, then and there, the first pangs of the compulsion to escape from this place which, in time, metastasised into a compulsion to end her life.